Your health is at risk! Protect yourself and find out what questions to ask and action to take. Asbestos is the name given to a group of naturally occurring mineral fibres that were used in a wide range of industrial and domestic products due to their strength, insulating features and resistance to fire. Loose-fill asbestos insulation is raw asbestos that has been crushed into a fine state and installed in ceiling spaces. During the 1960s and 1970s loose-fill asbestos insulation was installed in some residential and commercial premises in Australia. One company, which traded in the Australian Capital Territory as Mr Fluffy, was the main installer of loose-fill asbestos insulation. The NSW Government is required under the Home Building Act 1989 to maintain a register of residential properties that contain loose-fill asbestos insulation – the Loose-fill Asbestos Insulation Register. The register is available on the NSW Fair Trading website and each property can be searched for by its street address. Under the Home Building Act 1989, a property affected by loose-fill asbestos insulation must display a warning sign at its main switchboard once it has been added to the register. Note; Builders, contractors and inspectors working on or in Pre-1980 homes should check if loose-fill asbestos insulation is present in the home prior to commencing work or quoting for work, the Loose-fill Asbestos Insulation Register will only identify those properties that registered for testing with NSW Fair Trading and tested positive. As the program was voluntary it is likely that there remains other unidentified homes that may contain loose-fill asbestos insulation. 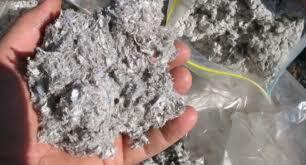 There are many other products that have the appearance of loose-fill asbestos insulation. In some cases in the roof space, loose-fill asbestos insulation has also been located underneath synthetic mineral fibre insulation (batts). Therefore, care needs to be taken to ensure the safety of people accessing the roof space in homes where loose-fill asbestos insulation might be present. If unsure of the material installed in the ceiling space, the only way to determine if the material is loose-fill asbestos insulation is by testing. The homeowner, building contractor or inspector should engage a competent person, such as a licensed asbestos assessor, to assess the risks and provide expert advice before commencing any work and accessing ceilings or sub-floor areas. No worker should enter the sub-floor, wall cavities or roof space of a home affected by loose-fill asbestos insulation unless they are a Class A licensed asbestos removalist or a licensed asbestos assessor. Disclaimer – This information is general and provides guidance to workers and employers on how to manage potential risks of asbestos exposure to loose-fill insulation in affected homes. It does not purport to be a comprehensive safety guide or apply individually to a particular affected home. It does not apply to asbestos removal or demolition of these homes. It is not legal advice and should not be relied or acted upon as if it were. Employers and any other persons reading this document must comply with the applicable legislation.